Please notice that these batteries are NOT FLAT-TOP type. Reliable 18650 Battery:Integrated with IC Protective Board, avoiding overcharge and discharge, protecting your flashlights, headlamps or laser pointers. Large Capacity: 4pcs Bigger power capacity of 4200 mAh makes your power devices works longer time. 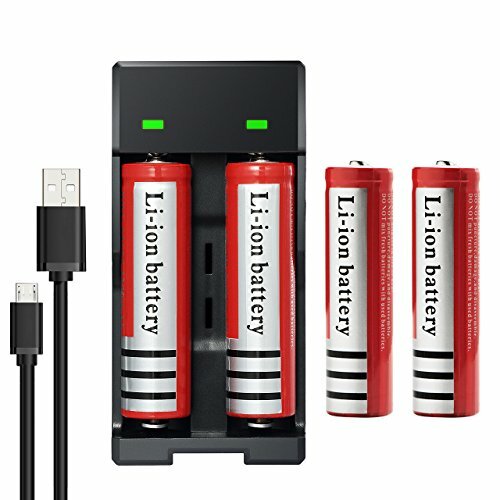 Charger Fits Multiple Types Batteries: It is compatible with Lithium Battery such as 18650,16340,14500 etc. 5pin-USB Multifunctional Charger: It can be charged by your laptop, power bank, car charger or AC adapter. It achieves the goal that you can charge the batteries anywhere. LED Indicator and 1 year warranty: Indicator Light--Green (Before Charge/ battery inserted in wrong direction )--Red (Charging )--Green (Fully Charge). We provide 1 year warranty for our items. Contact us if you have any questions. If you have any questions about this product by Deruicent, contact us by completing and submitting the form below. If you are looking for a specif part number, please include it with your message.